Sometimes you just need one, whether you're matching existing hardware, or using a different style on the other side of the door. This doorknob would pair nicely with a French lever handle. This nicely cast oval scroll doorknob measures 2 3/4" x 1 3/4"; projects 2 1/4". Uses a 3/8" threaded square connecting spindle. The spindle is not included with single knobs. Sold in multiple finishes; please click the drop-down "Options" menu to choose. Cast from solid brass, you'll feel the difference every time you use this high quality knob. For extra thick doors, you may purchase an extra long square doorknob shaft spindle (part number L-S5L) separately, which may be trimmed as needed. We offer an extensive selection of Victorian doorknob roses and doorknob backplates in many styles to suit this doorknob. How far from the edge of the door is the center of your doorknob? This is the backset, and determines which latch or mortise lock you use. For a 2 3/8" backset, we offer a tubular latch (L-6), and a privacy tubular deadbolt latch (L-43) option. 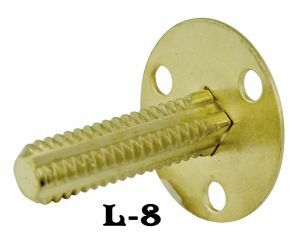 Very narrow panel doors or doors with lots of glass may need a 1 3/8" backset passage latch (L-6SB). If you prefer a full mortise lock with key function and mortise lock with privacy turnlatch function, we have 1 3/4", 2 1/4" or 2 5/8" backsets available. If you also need a turnlatch knob, we have an oval knob turnlatch (L-30A), and the popular crescent shape turnlatch (L-210TL).